iClient for Attorneys - Lite - from the developers of the popular iJuror - was developed with input from attorneys at small firms. iClient for Attorneys - Lite contains all of the same features as the full version of iClient for Attorneys except for the client file import & export as well as the Bluetooth client transfer capability. If you'd like these features, they're available in the full version of the app. 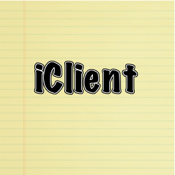 Use iClient to manage all of the clients for your law firm. iClient is a great app to consolidate all of your client information. Have all of your client information right at your finger tips in the office or out of the office. * Note: to delete anything in the app, just swipe the row - works just like the mail app! Simple! Once you start using iClient, you'll wonder you managed all of your client information before. We're always open for suggestions so please contact us with your ideas to make the app better!